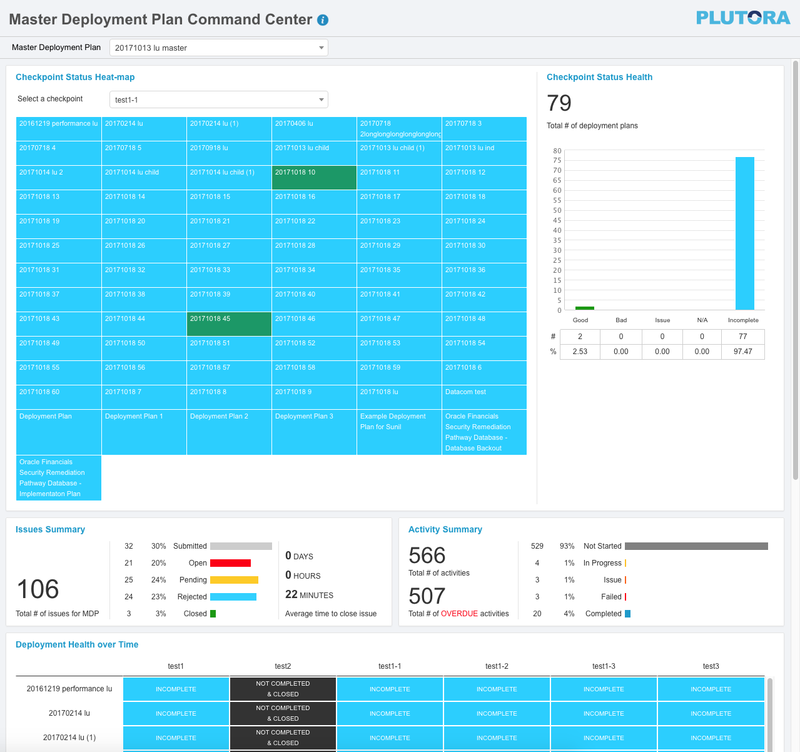 Command Center provides an executive view of the overall health of a Master Deployment Plan by making Checkpoint, Issue, and Activity data visible. Users must have the View Deployment Manager user permission to view this page. Go to Deployment > Command Center. Click to select a Master Deployment Plan. When a Master Deployment Plan opens, the most recent Checkpoint is displayed. Click to select a Checkpoint from Select a checkpoint. Boxes representing the Checkpoint status of a Child Deployment Plan (the Child Deployment Plan’s name is in white text and the boxes are sorted alphabetically by name). The Checkpoint status is determined by the way the Checkpoint questions have been answered. Black: Not all Checkpoint questions have been answered and the Checkpoint answer window has closed. Light Blue: Not all Checkpoint questions have been answered and the Checkpoint’s response window is open or upcoming. Red: If any answer is ‘Bad’. Orange: If any answer is ‘Issue’. Dark Blue: If any answer is ‘N/A’. N/A will only show as the status if there are no other statuses. Green: If all answers are ‘Good’. Master Deployment Plans without Checkpoints have the message: This Master Deployment Plan does not contain any Checkpoints. The Deployment Plan’s associated Systems (up to 9). A hyperlink. Clicking on the link opens a new browser tab with the Deployment Plan’s Checkpoint tab at the selected Checkpoint. If you make any changes to a Deployment Plan after clicking the line, refresh your browser to see your changes reflected on the Command Center. The Checkpoint Status Health graph summarizes the total statuses. This panel summarizes the Issues related to the selected Master Deployment Plan and its Children. Open: Red. A new status. Closed: Green. A new status. This panel summarizes the Activities related to the Master Deployment Plan and its Children. Each column represents a Checkpoint with the earliest Checkpoint on the left. Each row displays Deployment Plans in alphanumeric order.